Example of Punjena paprika recipe. Nut roll is a cake or pastry of yeast bread with one or more fillings. Example of Nut rolls recipe. Sauerkraut is finely shredded cabbage that has been fermented by various lactic acid bacteria, including leuconostoc, lactobacillus, and pediococcus. 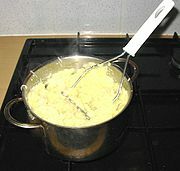 Mlinci (pasta tatters) is a dish in croatian and slovenian cuisine. Pita or pitta also called and less commonly known as pide, pite is an often round, brown, wheat flatbread made with yeast. Example of Stuffed pita recipe. Prekmurska gibanica is a layered cake, originating in the region of prekmurje, slovenia and neighbouring medimurje (croatia). Example of Prekmurska gibanica recipe. Žganci is made from maize, wheat or buckwheat flour, water, cooking oil and salt, which is cooked for fifteen minutes on a low boil. Baklava is a rich, sweet pastry featured in many cuisines in the area once controlled by the former ottoman empire, in central asia and in the lands in between. Krafne are round and usually filled with custard, chocolate, cream or jelly. Štrukli is a traditional croatian dish served in most household across zagorje and zagreb. Cevapi is considered a national dish in bosnia and herzegovina, serbia, croatia and montenegro, and are also common all over former yugoslavia. A crêpe is a type of very thin pancake (usually made from wheat flour).